Maybe you have a backyard with grass and a vegetable garden, or maybe you maintain a mini plant haven on a fire escape or sunny window sill. If you don’t have any real plants in your home, or don’t really consider yourself to have a green thumb—try making these super cute pipe cleaner flowers! Place them in a small planter on your desk or in your home, and let them bring you a little bit of joy and happiness. Crafting with pipe cleaners is great for children of all ages. If you’re a parent of small children, chances are that you already have a bunch in your home. Young children can better develop their fine motor skills by twisting and bending them, and older children can get creative with how they build and create with them. This craft is best suited for children ages 7-10. To make pipe cleaner daffodils, use yellow, orange, and green pipe cleaners. This step is the base for making other types of flowers too, like daisies and roses. Start your flower by laying three yellow pipe cleaners on top of each other in a star pattern (an X, with one pipe cleaner in the middle). Bend the pipe cleaners around each other to secure them together. Make sure that you maintain the same star shape. Pick a side of the pipe cleaner star and start spiraling it in to the center of the flower where the cleaners. Make sure to keep the spiral tight. Continue to spiral all pipe cleaners to the center of the flower. It’s okay if they overlap a little bit. Use a green pipe cleaner to make a stem for your flower. Attach the stem to the flower by bending it over the center of the flower where the pipe cleaners are connected. Twist to secure. If you want to make leaves, cut small pieces of green pipe cleaner, bend them in half, then twist the bottom together. Attach it to your stem by applying a small dot of hot glue to the leaf and then pressing it on. To make the middle piece of your daffodil, you will need a small piece of pipe cleaner. Use scissors to cut the orange pipe cleaner into a third of its length. Have you ever made a clay coil pot before? If you have, you will be applying the same technique to the pipe cleaner now. Start by making a small spiral (about the size of your pinky tip) with the pipe cleaner. Then start wrapping the pipe cleaner in a coil, building on top of the small spiral. It should look like a mini bowl or cup. The length of this coil should be about a half inch. Use a hot glue gun to secure the middle part to the flower base. Carefully add a dot of hot glue to the center (where the stem connects to the flower) and press the orange coil on. We recommend having a parent/guardian supervise this step for kids under 12-years-old. Even the most seasoned crafters can still get burned. Although one flower is nice, a bouquet will always look better. If you plan on displaying your flower in a pot, add some more to the bunch by repeating the previous steps. 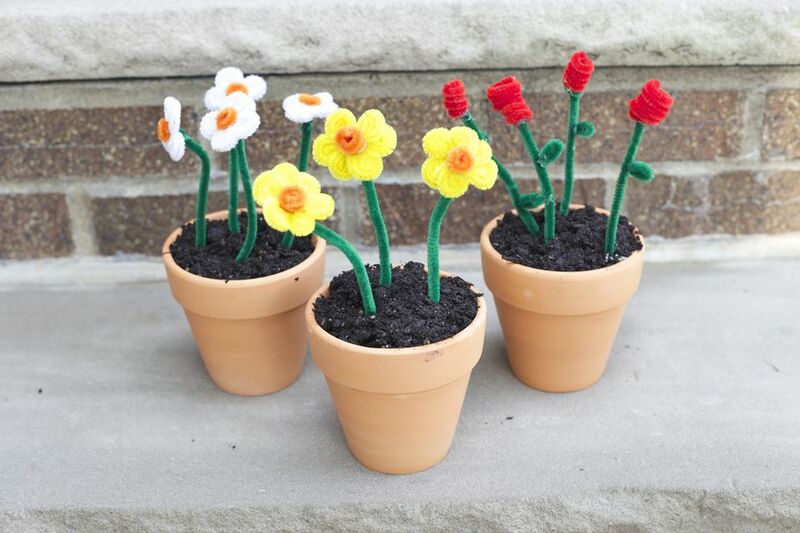 Plant your pipe cleaner flowers into a small pot. We used a terracotta one but any small planter you have at home will work. We recommend placing a small piece of floral arrangement foam into the bottom of the pot to help your new flowers stand upright. Arrange your new flowers, and experiment with these steps to make roses, daisies, and hyacinths: Use the coil step to make roses, and the spiral steps to make daisies.